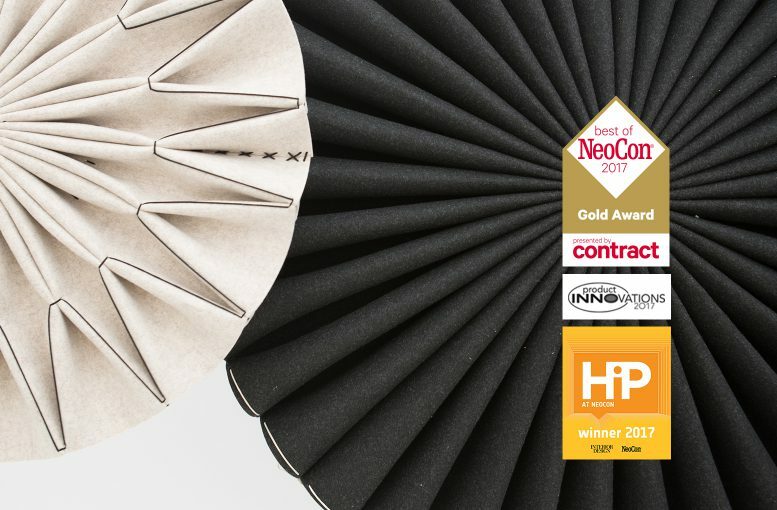 BuzziPleat, 13&9’s acoustic and lighting solution designed for BuzziSpace wins three prestigious awards at NeoCon 2017 in Chicago – the Best of NeoCon 2017 Gold Award by contract, the HiP Awards by Interior Design Magazine as well as the Merit Award by Buildings Magazine Product Innovations Awards. 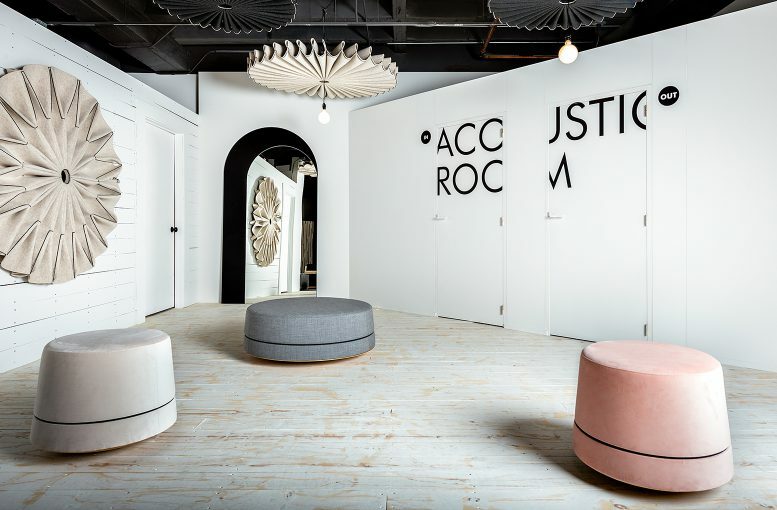 Since 2015, for the past three years, the transdisciplinary team lead by Anastasia Su and Martin Lesjak has received the Best of NeoCon Gold Award for their collaborations with both Mohawk Group for flooring design and BuzziSpace in the furniture category. The BuzziPleat framework relies on tension of its own fabrication, rather than an internal support structure. Fashion has long adopted this method to create neat, yet flexible forms. 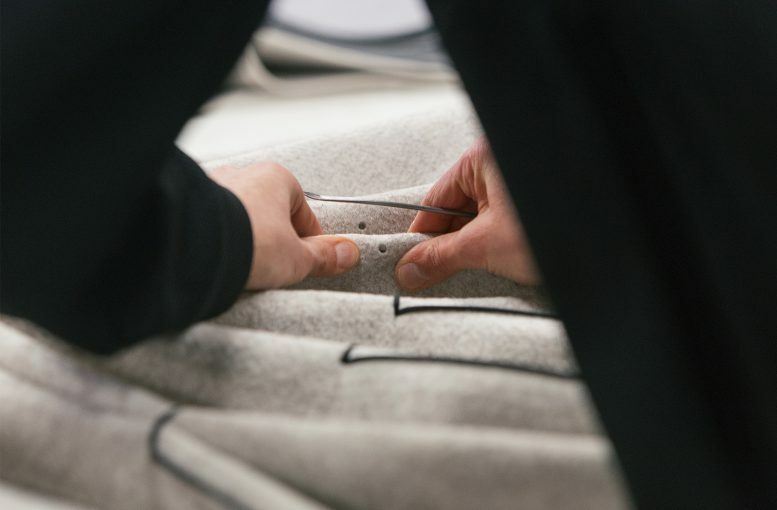 Here, the application brings an organic quality to an otherwise synthetic material. 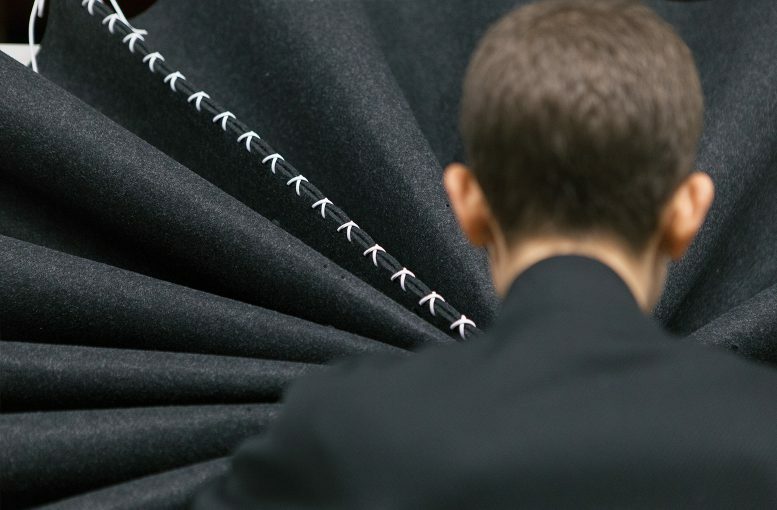 “Pleating brings movement to still objects, animating them from within,” said Martin Lesjak, lead architect and designer, 13&9. “It can therefore be seen as the symbol of a major social shift towards a rebounding society giving movement and elasticity to structure.” The hanging acoustic pendants can be configured with an optional light source add-on, to marry sound control and illumination in one multipurpose product. 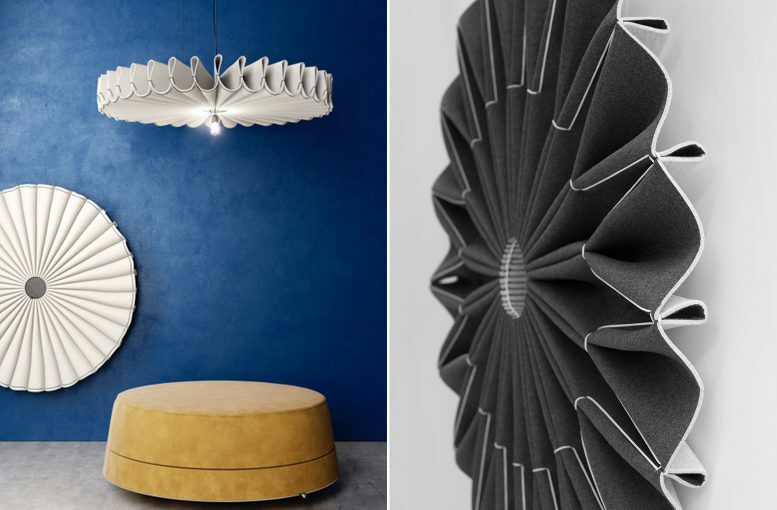 The collection includes two configurations, BuzziPleat Ripple and BuzziPleat Edel, both can be can be affixed to the wall or suspended from the ceiling. Each model is available in two sizes. Choose from a diameter of 100cm or 150cm. Select one of many BuzziFelt and BuzziFabric combinations, ranging from neutral to bold and bright hues. The hanging acoustic pendants may be configured with an optional light source add-on that marries sound control and illumination into one multipurpose product. The collection offers two configurations, BuzziPleat Ripple and BuzziPleat Edel, available in two sizes with diameter of 100cm or 150cm. The items are available in versatile colors including BuzziFelt and BuzziFabric combinations, ranging from neutral to bold and bright hues. BuzziSpace also introduced BuzziBalance High, a new edition of BuzziBalance which was previously honored with the Best of NeoCon Gold Award in 2016. The new model represents a taller seat, designed to pull up alongside a workstation. BuzziBalance High is a rocking pouf that provides an alternative solution to the static chair. This single seat option aligns perfectly with tabletops and desks. Like a stability ball, it helps improve one’s balance and posture, while simultaneously provoking joy and conversation. The BuzziBalance series is ideal for creative hubs in schools, libraries, offices, collaborative spaces, and more.